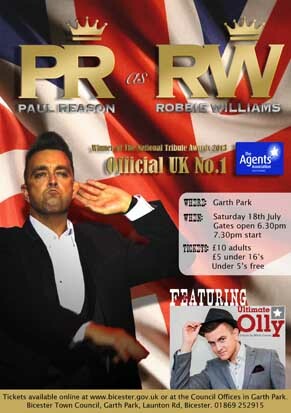 Please note that in the latest edition of the Garth Gazette the date for the Robbie Williams Tribute night is incorrectly stated as 8th July. The actual date for this event is Saturday 18th July. All other details are correct. For more information about this event, please click here. All systems go for the new Café and new public toilet facility. We are pleased to announce that we have chosen the team that will provide the new facilities in Garth Park and run them. The New Factory will build it and Savoir Fare will run it. It is all subject to the usual planning consents, but we hope that we will be able to launch the new facilities in the Spring next year (2016), So this time next year you could be sitting on the decking, sipping a lovely coffee, eating a sandwich made from bread baked on the premises and watch your young ones play in the new natural playground opposite. And have a decent loo to use afterwards! For more information and to read the press release click here. 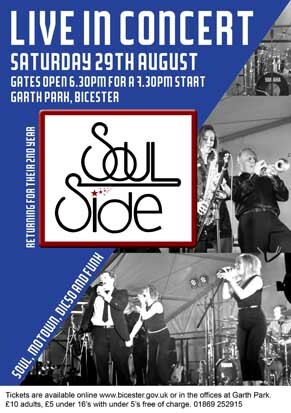 Tickets are now on sale for our evening summer events at Garth Park. Please click on the below links for more information about these events and details on how to get your advance tickets.